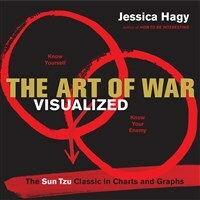 Sun Tzu's classic The Art of War, as it’s never been read before—illustrated with 200 of Jessica Hagy’s uniquely thought-provoking charts and graphs, making the 2,500-year old text accessible to a new generation of students, entrepreneurs, business leaders, artists, seekers, and lovers of games and game theory. Jessica Hagy is known for her Webby Award–winning blog Indexed and her cartoons, which appear regularly in the New York Times. She writes widely for national publications. Ms. Hagy lives with her family in Seattle.